If you want to accept online hotel bookings and reservations for other types of accommodation and hospitality services, then WordPress and its wealth of plugins will help you build a suitable website. However, with a number of excellent hotel booking plugins available for WordPress, which one should you choose for your website? That’s the question we’ll help you answer in this MotoPress Hotel Booking vs HBook vs WooCommerce Bookings plugin comparison. In this guide, we’ll explore the core features of each tool to give you the information you need to make an informed decision on which solution is the best choice for your project. What Can These Booking Plugins Help You Achieve? These plugins have been built to allow you to offer items that can be booked online, from your WordPress website. Once you’ve installed the plugin, you can start creating the bookable items, such as hotel rooms or apartments. As these are powerful plugins, they all have lots of settings and options that allow you to define the rates, availability, and other properties for your hotel rooms and other bookable items. Collecting payments and sending out booking confirmation emails are just a few of the useful features of the plugins in this MotoPress Hotel Booking vs HBook vs WooCommerce Bookings comparison. Also, these booking plugins have been built to integrate with any WordPress theme. Therefore, whether you already have a WordPress website or you’ve yet to start one, MotoPress Hotel Booking, HBook, or WooCommerce Bookings will be able to help you with your online reservations and bookings needs. By the end of this guide, you will know which one is best for your project. While Hbook and WooCommerce Bookings are more established plugins in this space, MotoPress WordPress Hotel Booking is a relative newcomer that is developing by leaps and aims to give anyone building a hotel website with WordPress even more options for how their site handles online bookings and reservations. Designed to work with any WordPress theme, the MotoPress Hotel Booking plugin will help turn any website into a fully featured online booking system with the ability to collect online and offline payments from guests. Thanks to the flexibility of this plugin, it can easily be configured to work with almost any type of accommodation-related business that wants to accept online bookings. Although this plugin has an impressive set of features and functionality, it’s easy to set up. The controls integrate seamlessly with the WordPress Dashboard and are clearly laid out and organized. There are lots of little aspects of this plugin that make it easier than you might think to build a fully functional online booking system. 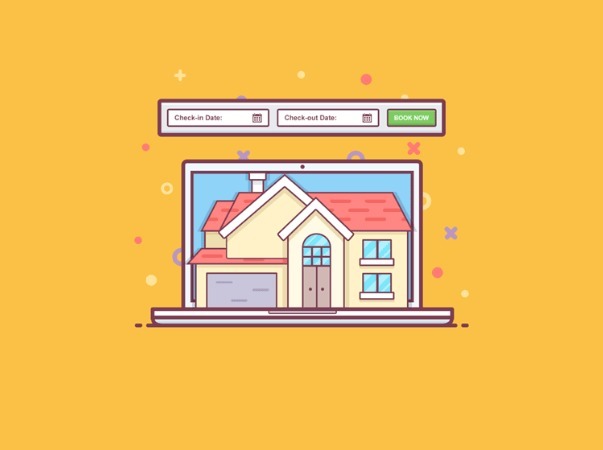 For example, being able to automatically generate multiple accommodation listings based on your initial settings is sure to come in handy for those offering more than one bookable item to their customers. The ability to quickly set custom rates and seasonal periods as well as create booking rules simplifies things too. Ability to set weekly, monthly, custom, and seasonal rates. The option of offering free and paid extras for each booking. Automatic synchronization with Online Travel Agencies (OTA) via iCal. Good built-in payment gateway support as well as an optional add-on for use with WooCommerce. Backend online plugin demos you can try now for free. It’s also worth pointing out that the detailed MotoPress Hotel Booking documentation will ensure you’re able to use this plugin to its fullest. Find out more about the MotoPress Hotel Booking plugin. HBook is another feature-rich hotel booking system plugin for WordPress. Like the other plugins in this comparison, HBook is versatile enough to work for many types of accommodation, including hotels, B&Bs, campsites, and more. As part of the configuration options of HBook, you have the ability to create multiple seasons, each with their own start and end dates. You can then use the rates feature to set the prices for those seasons – something that will ensure you’re always able to offer your guests the best prices while also managing demand. Other HBook settings make it easy to create booking rules, such as permitted check-in days and stay lengths. Special rates, discounts, coupons, and extra services can all be configured through the admin area of the plugin. When it comes to collecting payments from your guests, HBook provides you with a good set of options. Through the settings, you can give your guests the ability to pay on arrival, request a deposit from them, and save their card payment details on your site. Handling security bonds is part of the core functionality of HBook too. Integrating the HBook online booking system into your WordPress website is straightforward. The design and functionality of this plugin has been built to work with any WordPress theme, while the shortcodes make it easy to insert the forms into your existing website content. Customizable search and booking forms. Support for multiple payment gateways. Lifetime access to plugin updates after initial purchase. If you want to see HBook in action before making a decision, the four online demos do a good job of showing what this plugin can do. Find out more about the HBook hotel booking plugin. 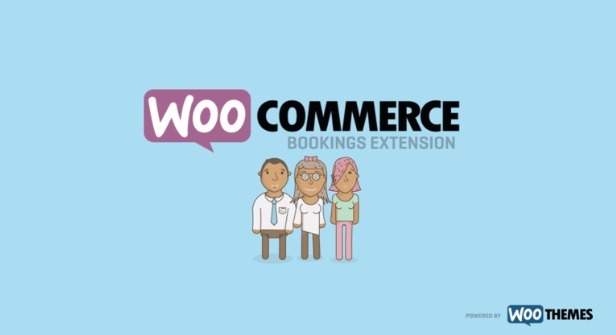 WooCommerce Bookings is a paid extension for the free WooCommerce plugin. As this is a versatile tool, it can be used for all types of bookings, including hotels and other forms of accommodation as well as services. Through the settings, you can define the properties for the bookings like the minimum duration and available dates. As this extension also works well for appointment bookings, you can set the booking duration as short as just an hour – something that might be useful if your hotel or accommodation offers stays for less than a full day. 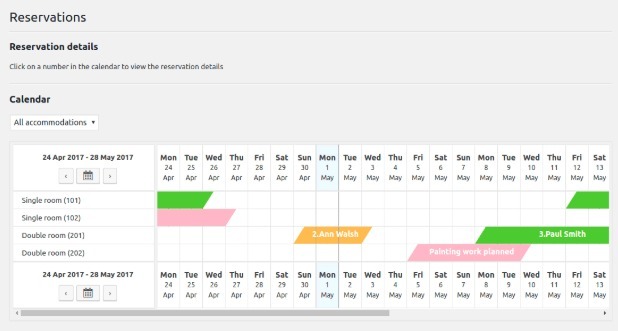 Defining the other properties of your service, such as the dates of availability, max bookings per item, and rates is easy, thanks to the clean and clear user interface of the WooCommerce Bookings plugin. Also, depending on how you configure this WooCommerce add-on, you can require manual approval for all bookings or choose to automatically accept them as they are made. Works with all modern WordPress themes. 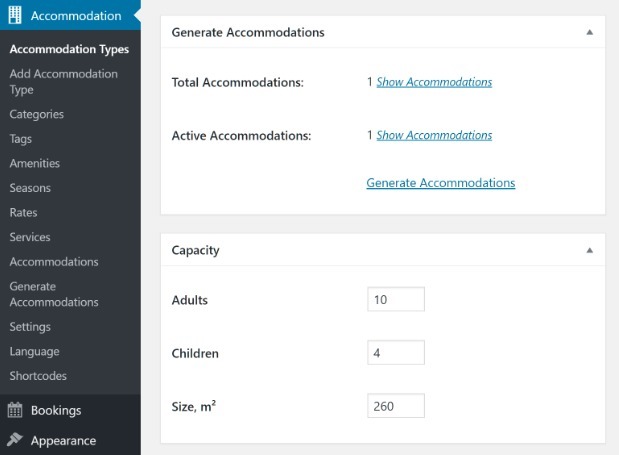 Lots of flexibility for handling all types of bookings. Built-in calendar tool for checking availability. Can be used alongside other WooCommerce extensions to meet your requirements. While a purpose-built hotel bookings plugin might be the best option for most people creating a website that can take accommodation bookings online, if your needs aren’t covered by a more traditional plugin, like HBooking or MotoPress Hotel Booking, then this flexible could be a good solution. Find out more about the WooCommerce Bookings WordPress plugin. With three impressive plugins for accepting and managing bookings online with WordPress, there’s sure to a suitable tool for your project in this comparison. Although there’s no overall winner – it really depends on your needs as to which plugin is best – if you are creating a fairly typical hotel or accommodation website, then choosing a focused plugin like MotoPress Hotel Booking or HBook is recommended. These tools cover everything you should need and are easy to get to grips with, thanks to their emphasis on hotel and accommodation bookings. But for those with more non-traditional requirements, a general purpose bookings plugin like WooCommerce Bookings could provide the flexibility that’s needed. So before you choose a plugin for your WordPress hotel or accommodation booking website, spend some time establishing exactly what your requirements are, then check out the feature lists to see which tool best matches your needs. Which plugin looks like the best solution for you project, MotoPress Hotel Booking, HBook, or WooCommerce Bookings? Please let us know in the comments below. Joe specializes in writing about blogging, web design, WordPress and digital marketing. If you need help with your blog or just want more great content head over to his freelance writer portfolio. 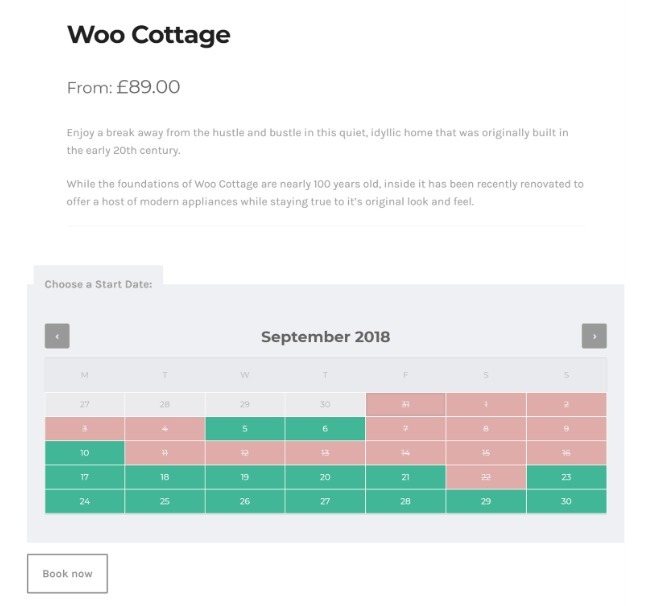 The post MotoPress Hotel Booking vs HBook vs WooCommerce Bookings Plugin Comparison appeared first on Torque.